Demonstrating the continuing attraction of liquids-rich North American unconventional plays, the stock market rewarded companies with significant investments in these plays in 2013, namely EOG Resources, which experienced a 40 percent rise in value to just under $46 billion in 2013, making the company the largest market capitalization gainer for upstream E&P companies, according to the “2014 IHS Energy 50 Ranking of the World’s Top Energy Companies,” released Jan. 27. According to the IHS ranking, service companies with significant investments in North America also saw their earnings grow significantly. The Top 15 Service Sector companies rose in value by 25 percent, reflecting industry demand and global optimism about new developments. Halliburton, one of the top performers, posted an impressive 47 percent increase in its share price value and a market cap of $43 billion. Schlumberger also saw its share price grow 30 percent to nearly $119 billion in market capitalization. 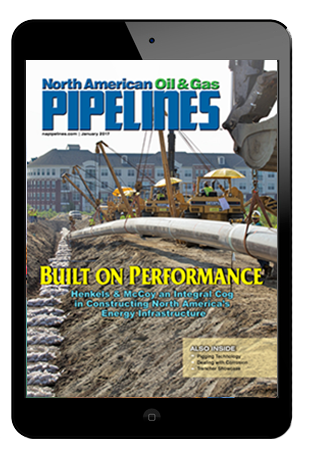 Not surprisingly, some strategically positioned North American midstream companies, which are a critical link in the unconventional energy value chain, also saw their value grow significantly. Enterprise grew in market value by 37 percent, reaching a market cap value just shy of $62 billion. Like their Service Sector cousins, the midstream companies also were star performers in 2013, with the 2013 Top 15 Midstream companies garnering a 26 percent rise in value above returns for the same set in 2012. Not to be overshadowed, the giant International Oil Companies (IOCs) maintained their top rankings on the IHS Energy 50 list by delivering steady growth and the highest market capitalizations. BG, of the U.K., which grew 31 percent in value to more than $73 billion, and Repsol, of Spain, which grew its value by 27 percent in 2013, or slightly less than $33 billion in market capitalization, recovered to win the segment’s titles of best performers after falling in value in 2012. The group of 16 companies in the IOC category posted a combined market capitalization of $1.7 trillion at the end of 2013, slightly more than 10 percent above their 2012 value. The IHS Energy 50 again showed little change in overall market capitalization in 2013, ending with a combined total of $3.78 trillion, which is 0.8 percent more than the value of the same set of companies one year ago. In terms of year-over-year market capitalization, National Oil Companies (NOCs) fared poorly said IHS – with the nine companies on the IHS Energy 50 dropping in market value by 16 percent, and as a group, falling below $1 trillion for the first time since 2008. According to IHS, investors became increasingly concerned that these NOC companies’ privileged access to resources is often tied to expectations that they will build value, not only for shareholders, as other companies must, but also for the parent state and key sectors of the host economy — a heavy burden for any one company to bear. Following some years of impressive market cap growth, the two Latin American NOCs on the Energy 50 suffered the greatest one-year market cap decline. Added Trapp, a shift of investment back to North America is a clear indicator of concerns about uncertainty far afield, notably escalating costs. As a result, he said, operator reaction to cost inflation may already be factoring into the value of Equipment and EPC companies, which showed only modest growth in 2013. According to the IHS report, the group only showed roughly a 5 percent growth in market capitalization over the end of 2012.